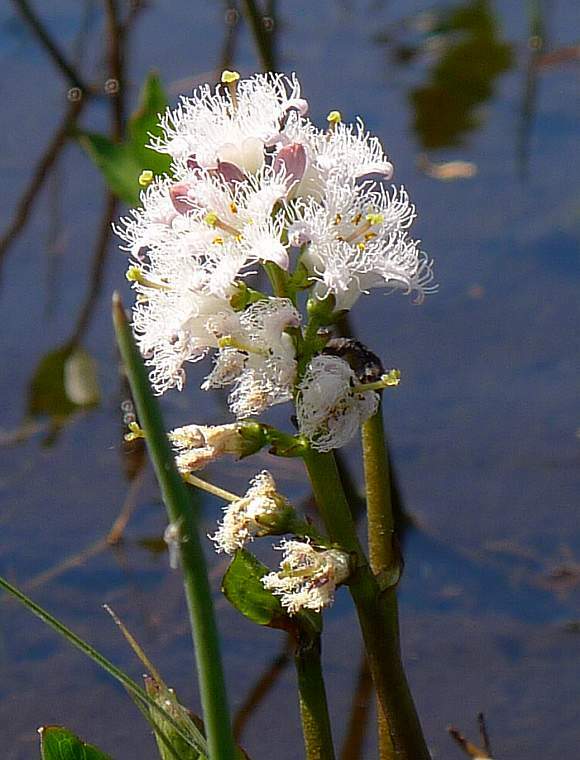 Bogbean enjoys being thoroughly waterlogged mainly in shallow acidic upland water or quagmires. 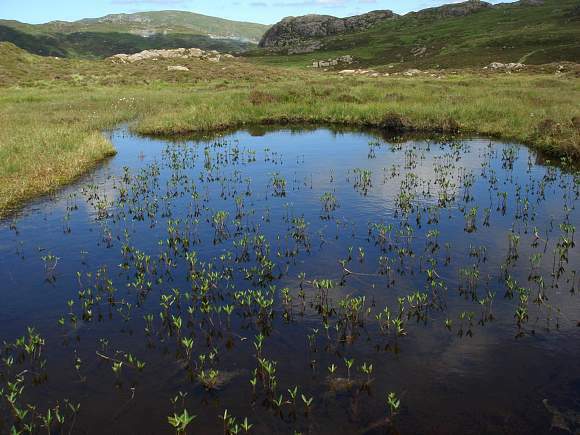 Bogbean likes to grow in hill tarns. It spreads by horizontal runners. Pin flowers. 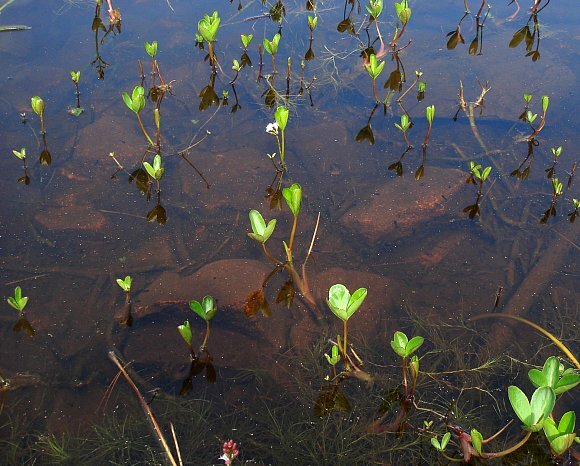 The trefoil leaves are above water-level. Pin flowers. Sepals on as yet un-opened flower buds are brownish and semi-circular. As-yet unopened flower buds are reddish and cylindrical. Pin flowers. Sepals on mature flowers are greeny-brownish, longish and tapering to a blunt tip. 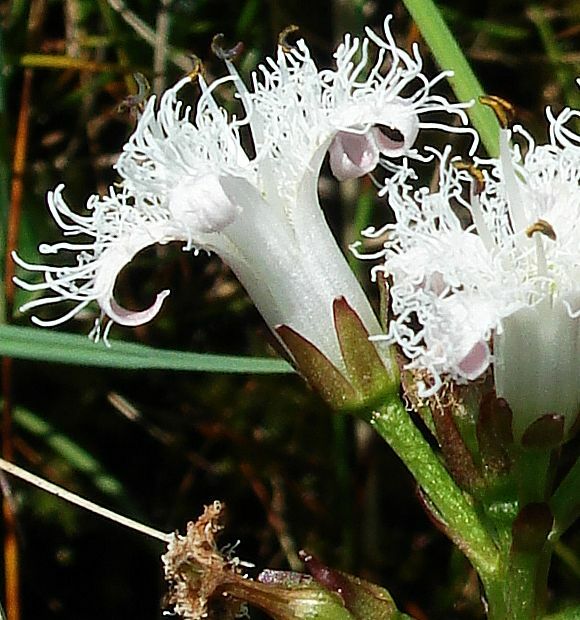 The style plus greenish-yellow discoidal stigma at the top exceed the height of the stamens (hidden below by petals) making this specimen a pin-type flower. Pin flowers. In full flower. Thrum flowers. A little passed their best. The sepals are now longer as it thinks about turning to fruit. Thrum flowers. The petals are fringed around the periphery. Anthers brown and shaped like x-chromosomes and are taller than the lower and hidden style making this a thrum-type flower. Thrum flowers. Strangely, this one has 6 petals rather than the usual 5. The style is still not visible below the anthers even from above, but it must be there somewhere; this is a thrum-type flower. The leaves are trefoil, albeit rather large. 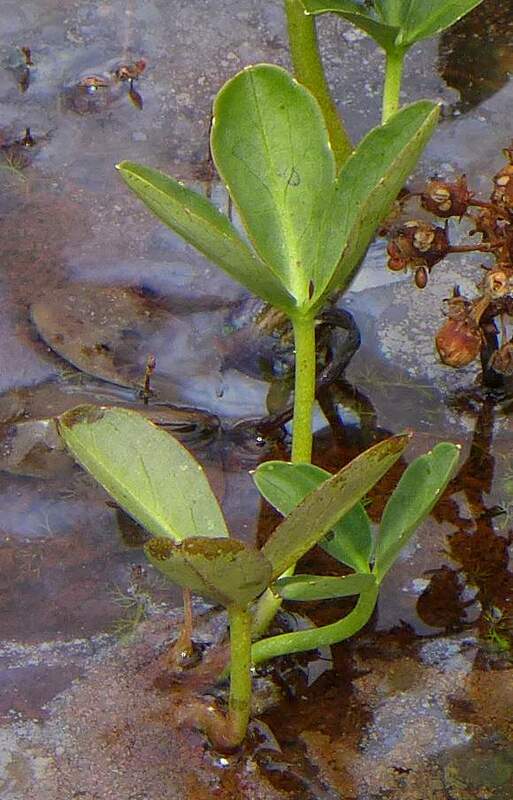 This specimen is branched just below water level, where the three stems join the horizontal underwater runner. 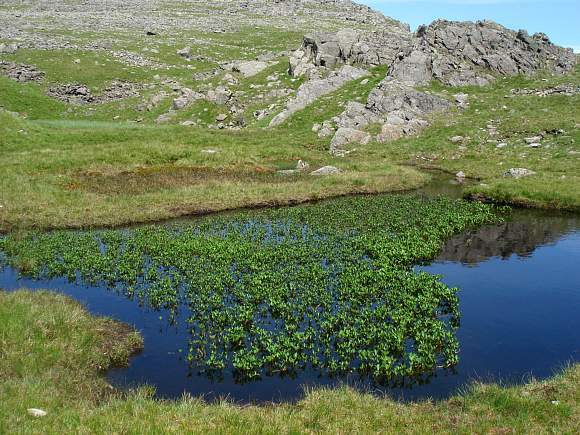 Whereas this specimen is branched just above water level. The brown spherical fruits look like miniature onions. One of the fruits has split open to several and release the few fawn-coloured seeds within. 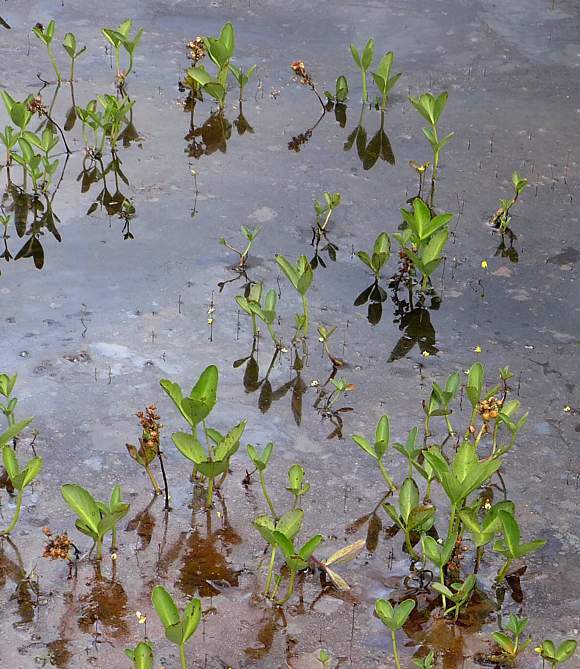 [Growing with oodles of Lesser Bladderwort which your Author failed to spot at the time, one of which is on the right]. Seeds within the brown fruits. Fruits as yet unopened anomalously floating on the water. Uniquely identifiable characteristics : the frayed white flowers and largish trefoil leaves. 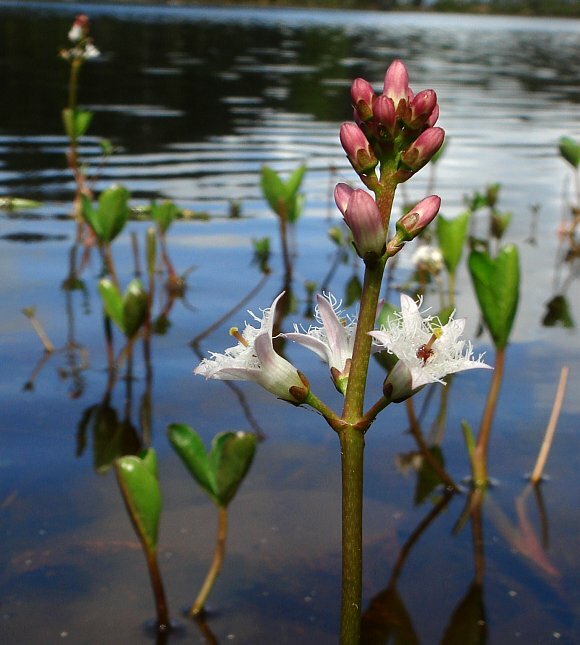 Bogbean is a very distinctive plant growing up to a foot above the water level in wet acid upland bogs, marshes, swamps, or fens. 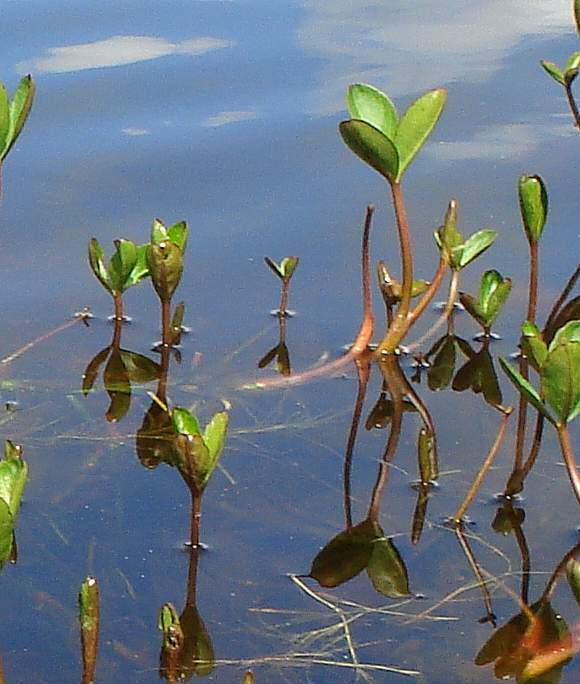 Its stems can be floating or sprawling, and up to 5 feet long. The leaves are trefoil (in threes). 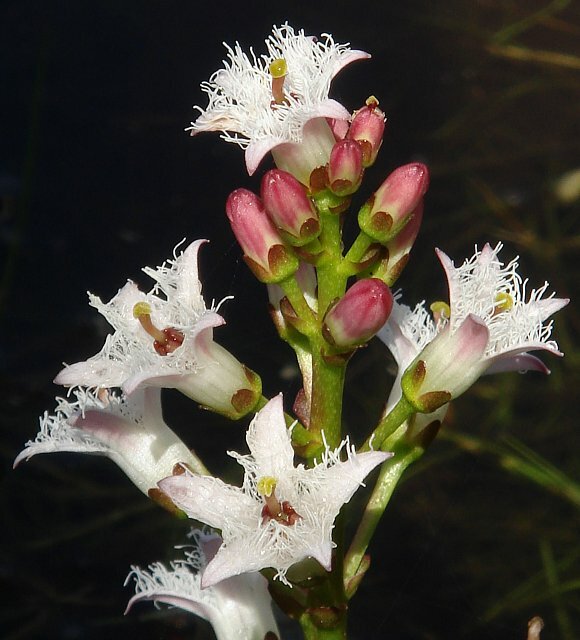 The flowers are white on the inside and pink on the outside with five petals. 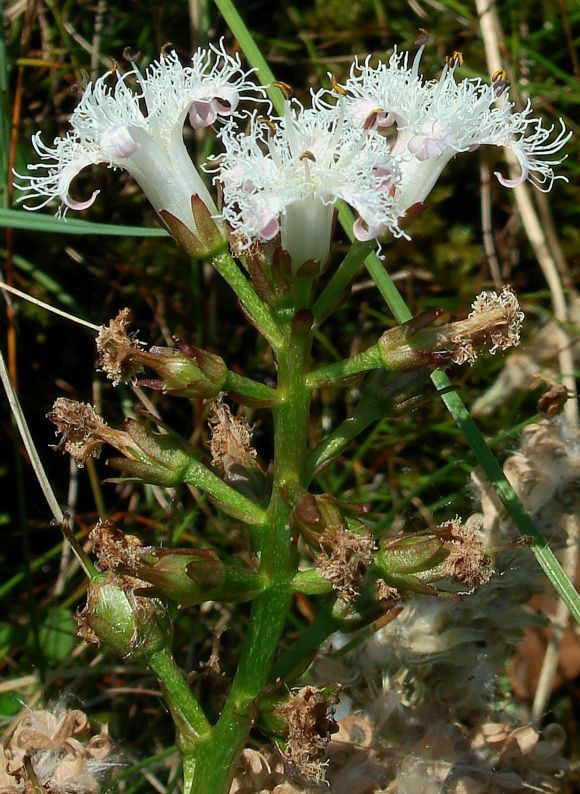 The five petals are heavily frayed or fringed with a spray of white straggly whiskers, much more frayed than are those of its only other family member, Fringed Water-lily. 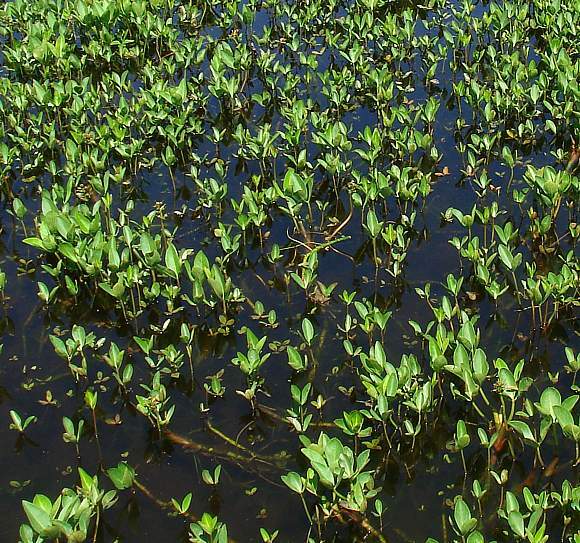 Both green and brown dyes can be extracted from this plant. In Sweden the leaves are used as a hop substitute in brewing beer for it has a strong bitter taste. 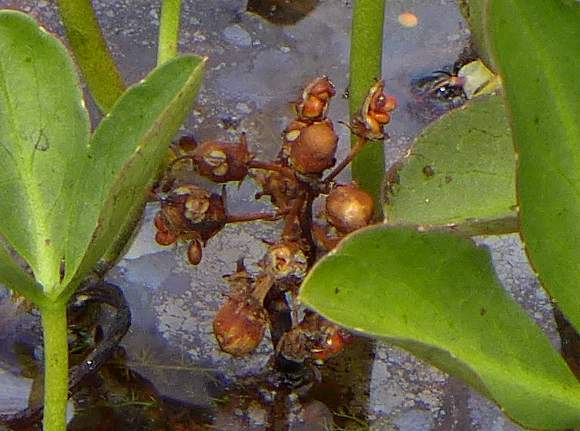 Bogbean contains the bitter triterpenoid saponin Menyanthoside. Also iridoid glycosides Foliamenthyn Dihydrofoliamenthin , Menthiafolin and Loganin. Some pyradine alkaloids including Gentianine and the coumarins Scopoletin and Scoparone. 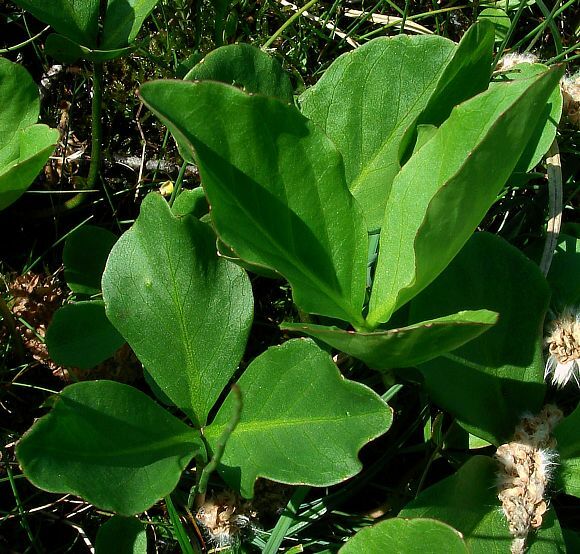 Loganin is a poisonous iridoid Glycoside found not only in bogbean but also in the fruits of the deadly poisonous Strychnos nux vomica, the plant in which Strychnine was first found. 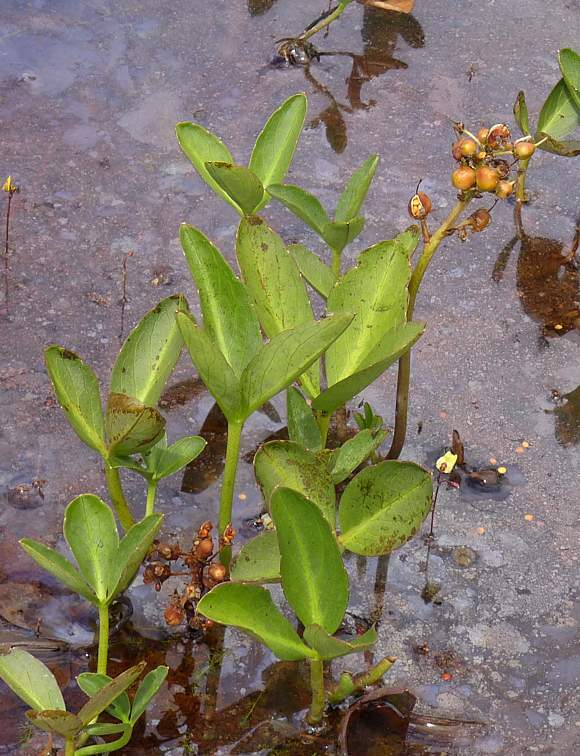 DeoxyLoganin is also present in Bogbean. 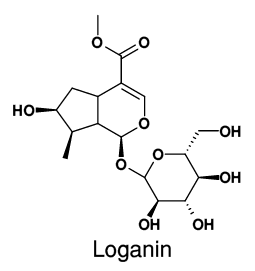 Loganin is a specific precursor in the plant synthesis of the indole alkaloids Vindoline, perivine and catharanthine . 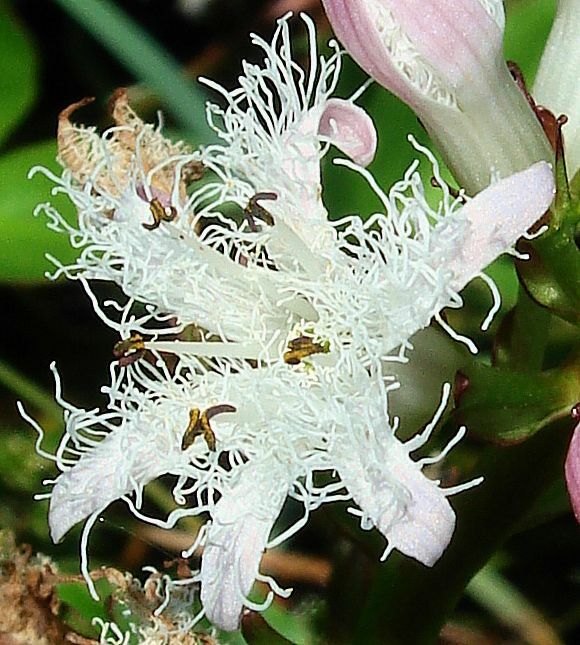 Menthiafolin is another poisonous Secoiridoid Glycoside found within Bogbean. 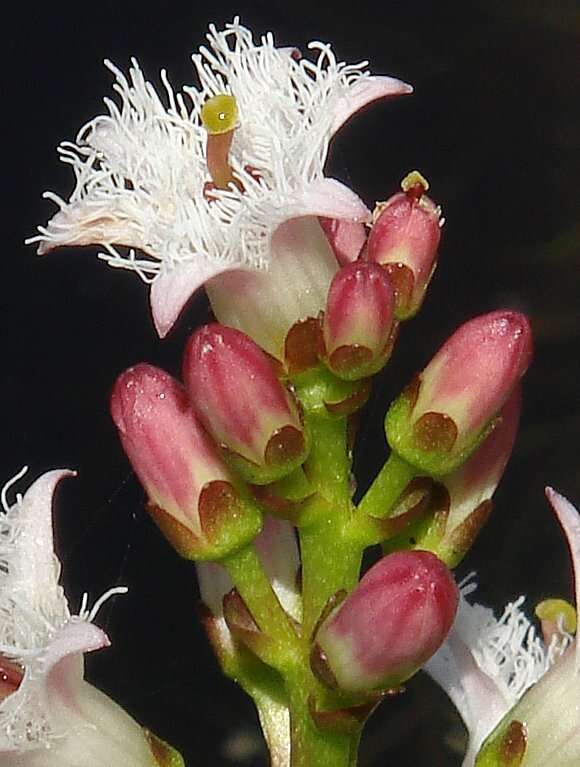 The closely related coumarins Scopoletin and Scoparone are constituents of Bogbean. Both are toxic. 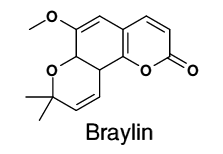 Braylin is another coumarin related to the above two and has vasorelaxing activity. 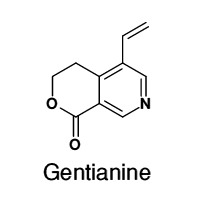 Gentianine is toxic alkaloid found in many species belonging to the Gentian family Gentianaceae, to which Bogbean used to belong, but that has since been moved into a Family almost on its own, the Menyanthacaea. 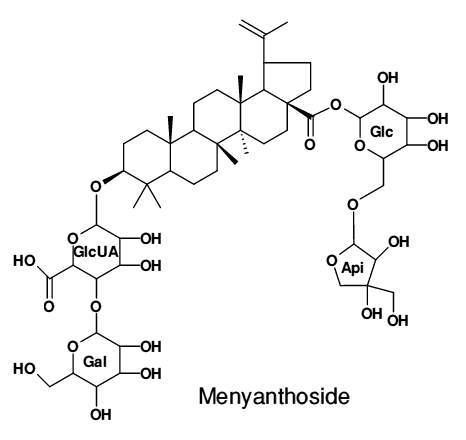 Menyanthoside is a saponin based upon the lupane steroidal triterpene Betulinic Acid. 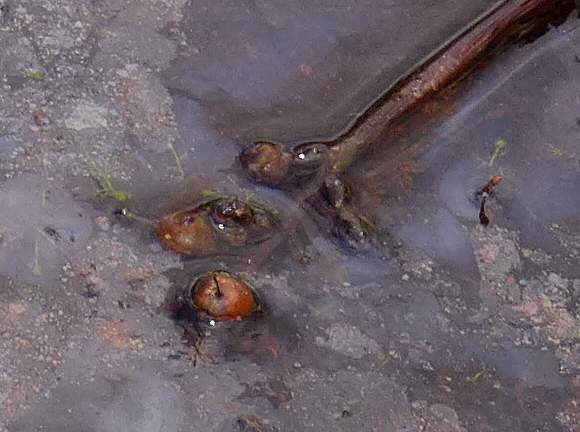 Note the sugars and etcetera are attached at two sites, both originally OH groups. Glc stands for Glucose , GlcUA for GlucoUronic Acid , Api for Apiose and Gal for Galactose .